The first guest during Guy Kawasaki’s feature presentation at Macworld was Jack Dorsey, who has recently changed his focus from Twitter to his new startup, Square. Square’s goal is to allow anyone to easily accept credit card payments on their iPhone or iPod touch using a tiny dongle that fits into the device’s audio input. Imagine how easy it will be to buy or sell items through Craigslist using a credit card. What if your friend owes you money but he doesn’t have any cash? Plug in the dongle, which Dorsey claims will be initially free (although I can’t imagine that strategy lasting forever), launch the Square app, swipe your friend’s credit card, and you’re done. Dorsey and Square are trying to improve the experience around credit card transactions. 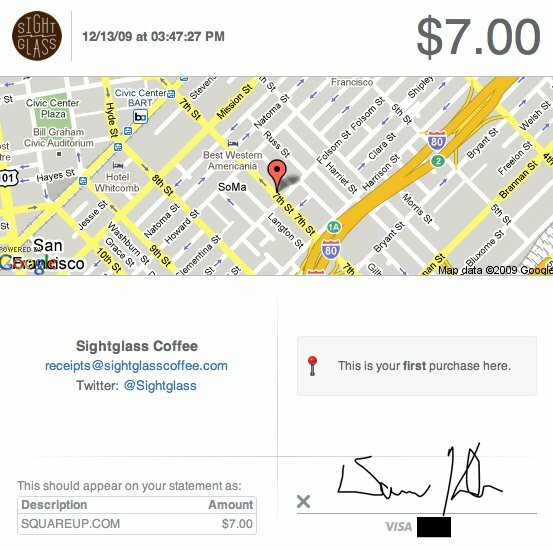 Instead of paper receipts, Square users can receive receipts via email. The image below is an example of one from when I visited Sightclass Coffee, a coffee shop in San Francisco that Dorsey often visits and was even mentioned during Kawasaki’s presentation (their coffee is delicious but the shop is still under construction so there’s nowhere to sit!). Is Square getting around traditional credit card security? Square is actually working closely with banks and is in full compliance with all credit card security regulations. Is the iPhone/iPod touch the only device that can be used with Square? The dongle is designed to work with any device that has an audio input jack. That means a lack of software is the problem for now. Dorsey mentioned Android, Blackberry, and even the Mac as devices that will accept payments in the future. How difficult is it to sign up for Square? Go to the website. 10 second process. We’re just waiting for the dongle to become available to those who aren’t lucky enough to be in the beta program. 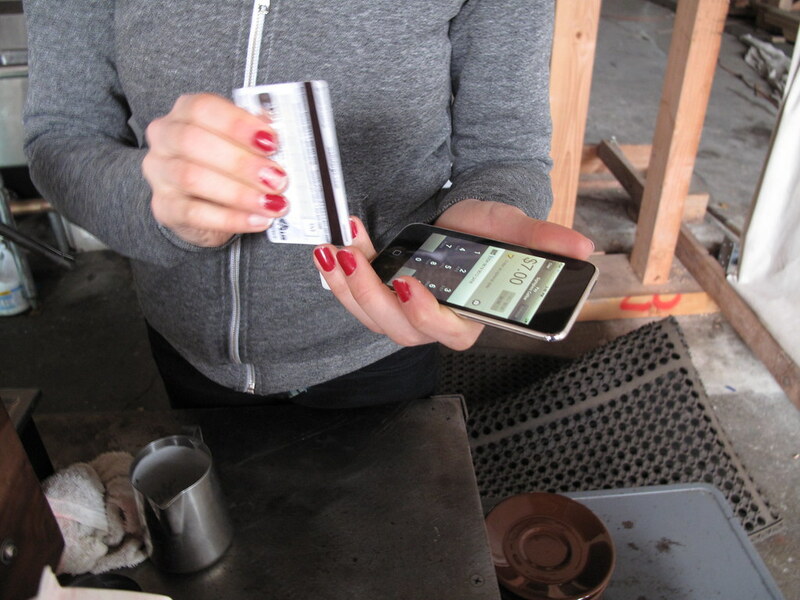 Below is a picture of Square in action at Sightglass. Note: The iPod touch’s audio input jack is on the bottom of the device, so the Square dongle is covered by the employee’s fingers. Really ..very very informative post. But I can already use my card for paying for things online, and an iPhone is, amongst other things, a phone, so at best this saves me typing from 16 digits? iPhone’s can’t multi-task so how would you run the square software and a card cloner at the same time? The iPhone can and do multicast. Apple decided not to allow applications to use this. But if the iPhone is jailbroken is EASY to put an application in the background. Not only that, but if the application shown saves a record inside the phone, it would be trivial to get the file and the card information with it. will never work it is signature rather than chip and pin also card cloners would have a field day as it is just a card swipe rather than a chip read, so people will sit there in there house swiping cards all day long charging the accounts to some account in Africa. How did they know what e-mail address to send the receipt to? I didn’t see you enter an e-mail address in the video. @Patrick: the purchaser has a Square account also. It is so easy to set up, a great many people will create a square account so person to person transaction will almost eliminate the need for cash. Privacy? It was overrated anyway. what happens if people dont sign up for a square account? do both the customer and the business owner both have to have accounts? Actually, I don’t have a Square account. I’ve been to that coffee shop before, and I entered in my email address during that prior visit. I assume it’s like the Apple store – they connect an email address to a credit card to make the process easier for repeat customers. how do I register an account with square. I don’t see it anywhere on the website. so i cant register with square? cos i dont have an account and wanted to register with them. there is only an option for login now only. can u connect this with your already merchant service? I assume you have to create an account with Square. but can you link it to your merchant account you have already? Rest of the world is moving away from the credit card magnetic strips (Square’s system could be integrated to a automatic credit card printer that makes copies of customer’s credit cards in the backroom..) to smart chips. In some countries you cannot even use your credit card if it doesn’t have a chip. Overall the system looks pretty nice but I wonder when they’re moving to this century? I think this is a USA thing, no one here has chip and pin. The real thing isn’t the dongle, that’s just an artifact of the mag stripe model. It’s the fact that a merchant can get started taking cards with simple sign up and no proprietary swipe device or card network contract. When (if?) chip and pin cards become dominant in the USA, they will have a chip reader attachment (maybe bluetooth or wi-fi) and you’ll punch your pin into the screen vs. signing. As far as your point about copied cards? Well almost any POS system is technically capable of enabling that since they also get the swipe. The US isn’t anytime soon and that’s a huge market. In the UK we use chip and pin, but if for some reason this doesnt work, they usually swipe your card instead. anybody know if this is available in the UK yet? i cant find anything on it, and it would make my own business’s handling of fees a lot easier than constantly cashing in cheques! Are they using these in the Apple Stores now? No Apple has a different system. The iPod touch slides into a case that has a card reader on the back. Hey David. Are you based in SF? sightglass rocks. Any out of towners that are here for Macworld, Philz, Blue Bottle and SightGlass are the three best coffee shops in the city. Hey yeah I am. You listed some great places. Do I know you? You look really familiar and I swear I saw you today at the show. The hat is the key. Yeah David. i live in SOMA and work in the startup space. I was at macworld yesterday cruising around. Yes. This is going to be huge. I can see the app and dongle being free because of how much money they’re going to make on transaction fees.